Update: This post was originally published in May 2013. 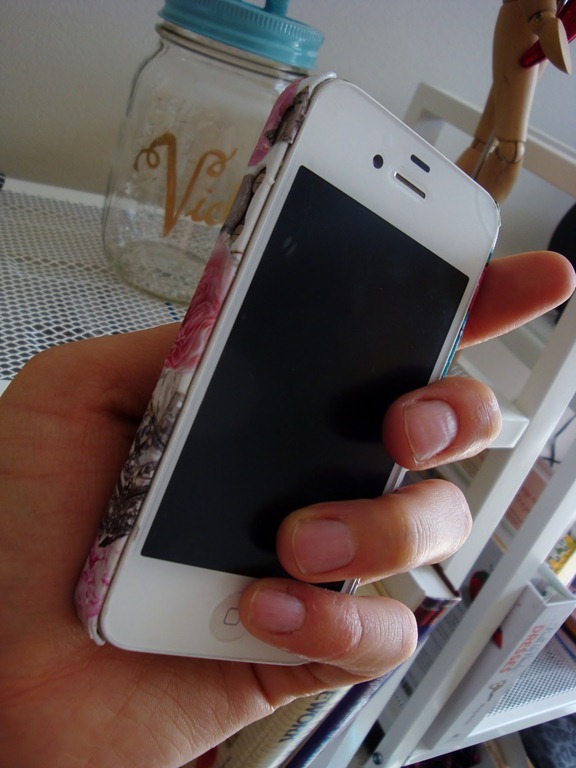 Even though I have moved on to a new iPhone this is a creative and fun way to personalize your phone case. 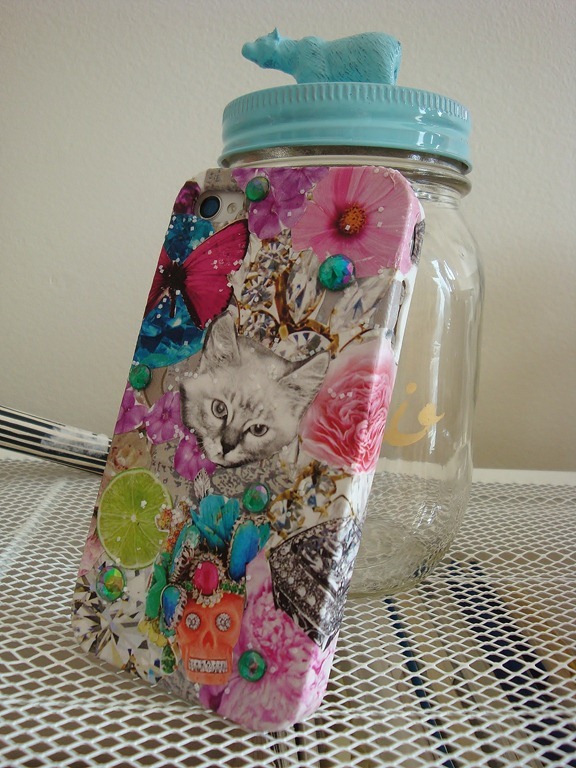 This case lasted a long time and the jewels never fell off! Yay Mod Podge! 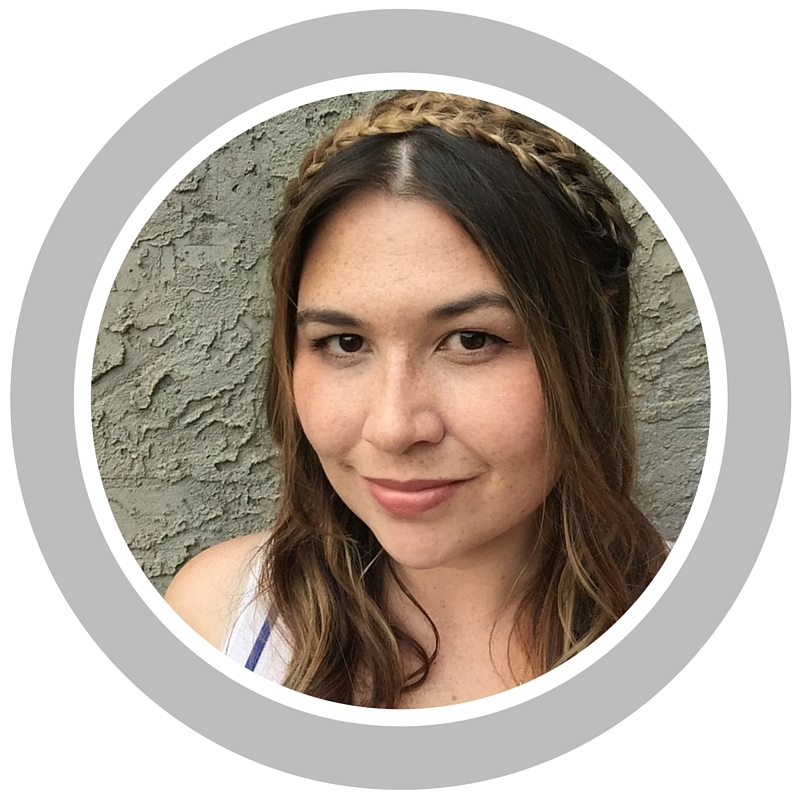 Spring has finally arrived and it’s time for spring cleaning, swapping out the winter clothes for the summer ones, and giving things a general sprucing up. Some of these chores might not be fun but they need to get done. My iPhone case was something that need a spring revamp but instead of just picking one out at the store, which I admit can be fun, I decided to personalize one with this quick DIY. It’s also a great way to use an old case that might be scratched or your just tired of the current image. Just make sure you clean it well so the Mod Podge will adhere properly. 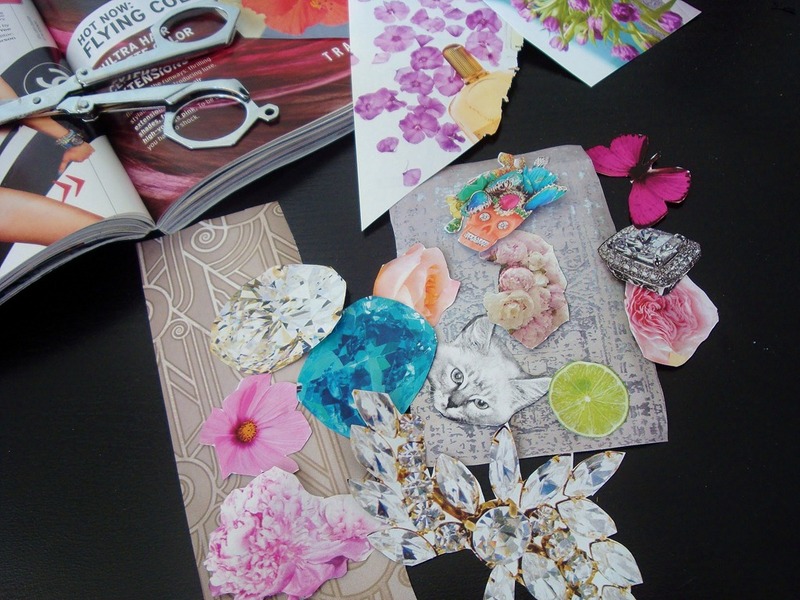 Decoupage is an easy and enjoyable way to decorate pretty much anything with a flat surface. It involves cutting out various shapes of paper, usually from magazines, and applying coats of varnish to seal it. I looked through old issues of Instyle and Cosmo to find pictures I liked then used my trusty Mod Podge to seal it. 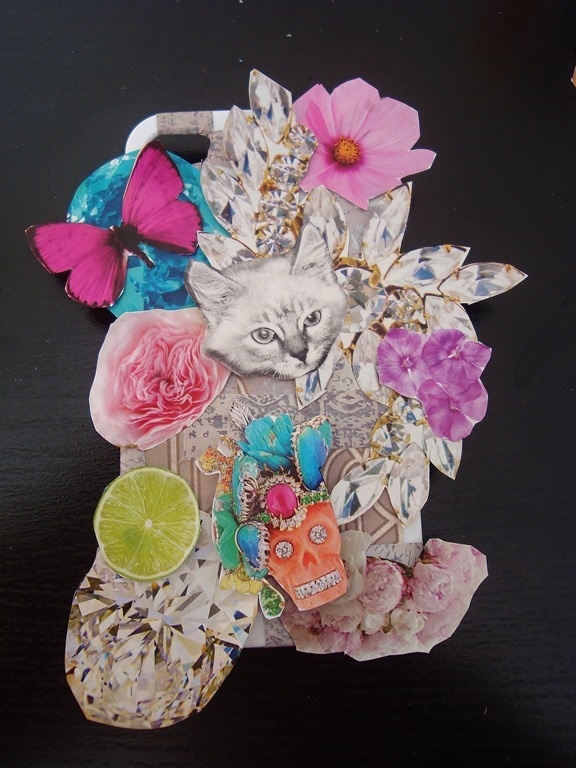 After finding some pictures of gems, flowers, and a cat I laid them out over a plain white iPhone case to get an idea for placement. Then I applied a thorough coat of Mod Podge to the back of the cut-outs and stuck them down. Your fingers will get sticky and you might have to carefully smooth out the paper if there are any air bubbles underneath. I wrapped the pieces around the edges of the case to get a full covering. The inside doesn’t look very pretty but no one will see it. Once you have all the cut-outs you want apply an even coat of the Mod Podge over the entire case. This will help the corners not to raise up. 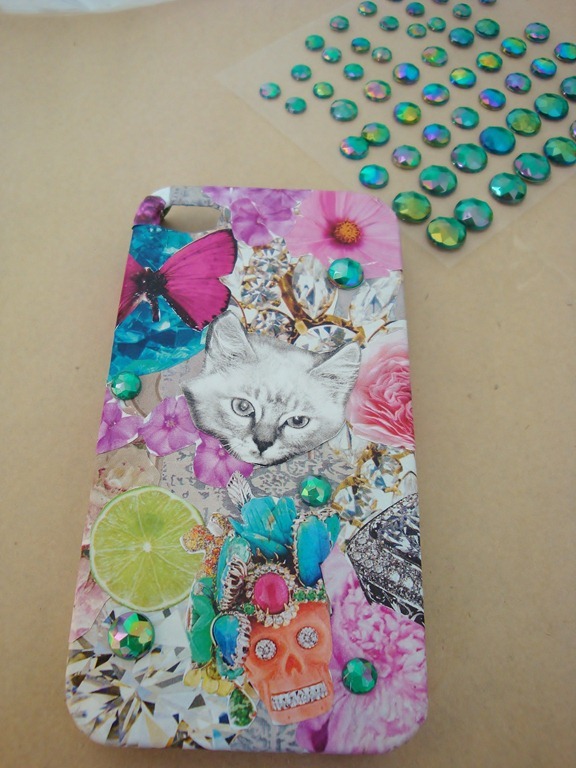 I wanted this case to be pretty girlie so I added stick on gems and glitter! After letting the glue dry for a few minutes (till it was tacky) I placed on the gems. Then I mixed some glitter with the Mod Podge and applied another thick even coat. I didn’t apply the glitter coat to the inside of the case. Let dry fully for a couple of hours and your case is ready for use! I wasn’t sure how well the gems would stay on. I’m not very careful with my phone, it usually hides out at the bottom of my tote bag/ huge purse, but I have been using it for over a week and they’re all still there! That Mod Podge really works! We all use our cell phones so much now. It’s nice to have a case that makes me smile and that I like looking at everyday!